Try your hand at clay sculptures in this clay workshop with Twisted Earth Ceramics. 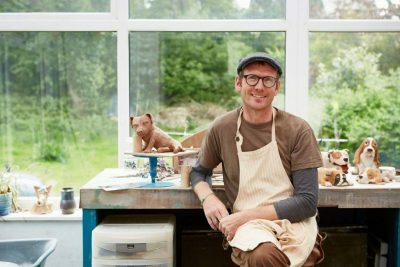 At the workshop you will learn some of the key skills of the sculptor and in the process you will create your very own resting hare sculpture. The workshop is suitable for beginners, restricted to a small number participants and will run for the majority of the day, approx 9.30am – 4.30pm. The workshop includes quality clay, sculptors tools, a days tuition, 2 x firings in the kiln. Your piece could then be worth more than the cost of the workshop, to keep or give as a gift! Your sculpture will be ready once it has been fired three weeks after the workshop. I’m Richard from Twisted Earth Ceramics. Here I make hand-crafted animal sculptures, vessels, wall hangings, pet commissions, and run workshops throughout the year. I was first introduced to ceramics in 2000 whilst living in New Zealand. Here I enrolled onto a ceramic workshop and learned the very basics from a brilliant teacher I will never forget. My work since then has been evolving through many hours of studio time, workshops and classes alongside many influential artists. I currently spend hours perfecting my technique and producing what I love!